For the Māori of the Taranaki region, Mt Taranaki (Mt Egmont) was a sacred place which they dared not climb. 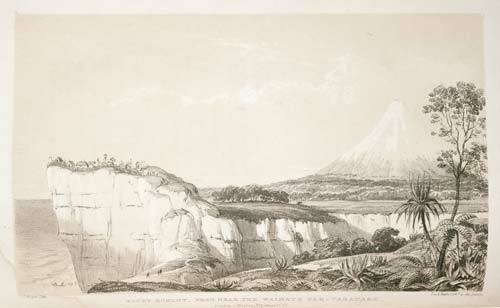 In this 1840 lithograph prepared by Charles Heaphy, a draughtsman for the New Zealand Company, the mountain has an overwhelming presence. Another company employee, scientist Ernst Dieffenbach, climbed it on Christmas Eve 1839 with the whaler James Heberley. In the same year James Bidwill also broke Māori tapu when he climbed Ngāuruhoe.